This breed definitely deserves its huge popularity. Devoted, obedient and amiable this dog is excellent with children, other dogs and household pets. It is capable of being a calm housedog, playful yard dog and intense field dog all on the same day! Labrador Retrievers are strongly built and very active, loyal, good natured and hard working. Developed in the 19th Century from Newfoundland dogs, Labrador Retrievers first arrived in Britain on fishing boats travelling to Poole Harbour, Dorset. Locals were impressed by the dogs ability to help fishermen haul their heavy nets ashore and began keeping them as working animals. Sportsmen also began to appreciate it as a valuable gundog suitable for wild fowling. Now one of the most popular breeds Lab Retrievers work not only as a gun dog, but as an impressive sniffer dog with police forces world wide and highly prized guide dog. Retrievers are non aggressive and make wonderful pets, they are not great watchdogs! 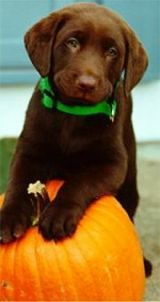 Lab Retrievers need plenty of exercise, need to be taken on long walks and loves to take part in field sports and swim! 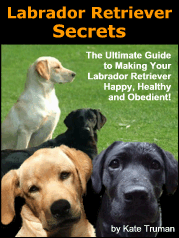 Discover how you can make your Labrador Retriever the most obedient and happiest dog alive!